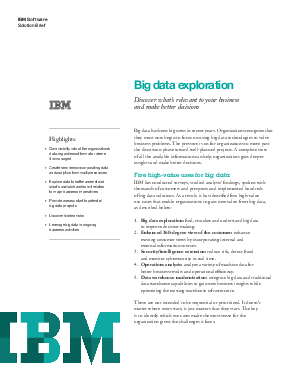 Big data exploration addresses the needs of organizations at multiple points in their big data journey. In the initial stages it enables them to gain secure access to all of their data and develop a full awareness of the available data and potential value across many different silos and locations. Using IBM Watson Explorer, organizations can discover and tag relevant data and understand key relationships within the data, and develop hypotheses for further analysis. In addition, this solution forms the foundation for applications that connect employees with all of the data and analytics they need at the point of impact, to improve customer engagement and accelerate innovation.